Late last night, we anchored at Brown Bluff, hoping to go ashore to visit a colony of 30,000 to 40,000 Adelie penguins this morning. Our group was scheduled to go first at 5:30 am, with a wake-up call at 4:30. Alas, it was not to be – Amundsen was not smiling on us today! At 4:30, Robin announced bad news and good news. The bad news was that there would be no landing this morning. The good news was that we could go back to sleep. Over night, a storm had moved in and there were 40 to 50 mph winds in this area of Antarctica. There is no way to safely operate the Zodiacs in these conditions. Mark and I had suspected this was the case, when we awoke at 3:30 to hear the engines starting. We looked out of our window, and realized that the weather was absolutely horrible – it could not have been more different than just 12 hours before, when we were all partying on the aft deck in the gorgeous sunshine. So, a day at sea it was to be. The Expedition Team made the most of it by presenting lectures on krill, life in the Southern Ocean and ice – much more exciting than they sound, I assure you! To also fill in some time, the head chef, Christian, and the pastry chef, Juan, led a cooking demonstration. Juan made torrijas, which is a Spanish version of French toast (delicious), while Christian threw together graved lax (a cured salmon, to be served at dinner on Sunday evening after the appropriate aging period). In between these offerings, we squeezed in a load of laundry at the self service area, which is very conveniently located just a few doors from our suite. At 6:45, we had the briefing for tomorrow’s expeditions, and a recap of yesterday – recall that we had forsaken the recap on Thursday night in favor of cocktails outside. Even after a rough day at sea, the team is still gaga over the Emperor Penguins. Their enthusiasm is definitely infectious! In the briefing, Robin informed us that we will continue to sail through the night, and expect to set anchor in Neko Harbor around 8:00 tomorrow morning. Following the shore landing, there will also be an opportunity for a Zodiac cruise. I think all are really excited by the prospect to be active again. Since the blog is a little light today, we thought we would tell you a little more about the ship. It was purpose built for polar voyages – both Arctic and Antarctic. The suites are surprisingly spacious with a desk and sitting area close to the window. We decided to go for a Vista Suite (fairly middle of the road from a price perspective) on deck four. The majority of the cabins on decks three, four and five are the same size – the differentiating factor is the size of the view. Suites on deck three have the smallest windows, those on four are quite a bit larger – picture window size – and the cabins on deck 5 have a sliding door with a tiny verandah. 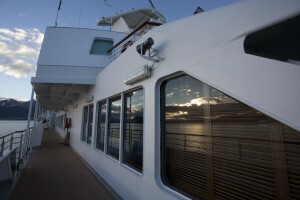 Public areas of the ship are spread out across decks and fore / aft of the ship. Starting from the bottom on three, there is a reception area – much like the reception area in a hotel. Deck three is also the point of disembarkation / embarkation to and from the Zodiacs. There is a “mudroom” or changing room where all of the boots are stored, so this area sees much traffic on a daily basis. In addition to the cubbyholes for storing boots, the mudroom has a large shower area where boots are washed and scrubbed. As visitors to this amazing landscape, it is our responsibility to take the utmost care to protect the habitat. Continuing with the ship tour, on deck four are the boutique (small gift shop), the fitness area (one each of a treadmill, stationary bike, elliptical trainer, and weight machine), the self-serve laundry, the beauty salon, and the restaurant (unlike most Silversea vessels, there is only one true restaurant on the Silver Explorer). On deck five, the Bridge is forward, and the Panorama Lounge and Internet Café / Library are aft. The Bridge is open pretty much all the time, and it is really fun to wander in and out for a different perspective. There is also a Bridge cam, which is broadcast on the TVs in each suite. In addition to serving drinks for the majority of the day, the Panorama Lounge also serves afternoon tea at 4:00, and tapas at 6:00. The rest of the public areas are on Deck Six with the Observation Lounge and Theater fore, and the whirlpools and Outdoor Grill at the stern. The Observation Lounge is similar to the Library in that it is lined with books of all varieties. The 270* view is hard to beat, anywhere on the ship. The Theater is where all the lectures and briefings take place – and there is always someone waiting to serve you a drink on all of these occasions (the coffee is phenomenal!!). And finally, deck seven is home to the Zodiacs – which we consider to be the Land Rovers of the expedition. These work horses ferry passengers back and forth to the landings as well as cruising around. We have talked about the weather multiple times throughout this blog – we are told that the Antarctic weather can change drastically within minutes. As a result, when the Expedition Team first land the Zodiacs on shore, about 4oo pounds of survival equipment including tents, sleeping bags, rations, etc. accompany them. These provisions are a precaution in case extreme weather makes it impossible to use the Zodiacs to safely return to the ship. 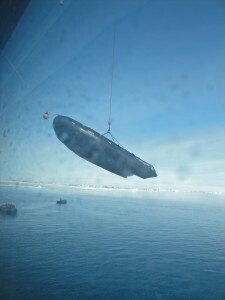 Shown here is a view of a Zodiac being dropped from deck seven to the water below, right outside our window.